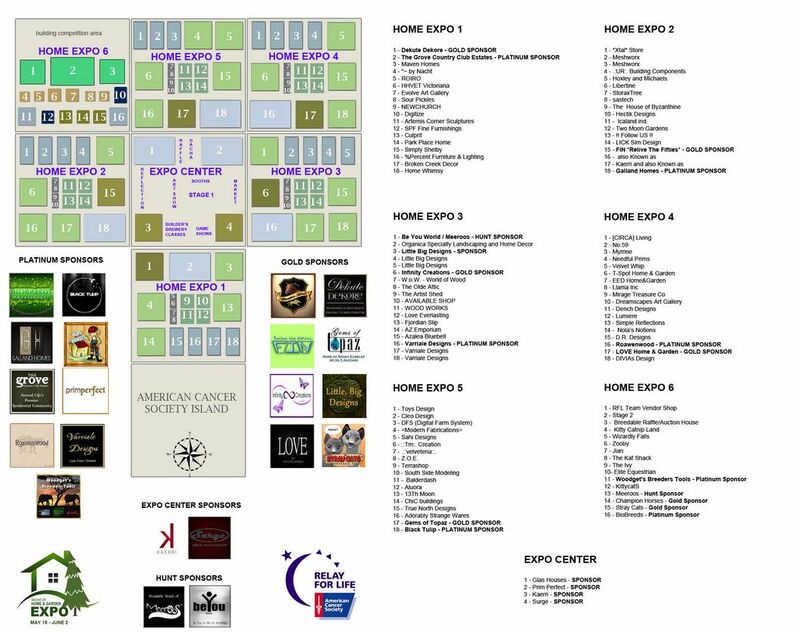 The 10th Home and Garden Expo (HGE) in support of Relay for Life of Second Life and the American Cancer Society, is currently open, and will remain so until Saturday, June 2nd, 2018. Taking place across seven (Home Expo 1 through 6 and Expo Centre) regions, the event offers some of the finest in home, garden, and furnishing designs available across the grid, as well as a range of breedables and breedable accessories. With over 100 exhibitors taking part, the event offers something for anyone who is looking for a new home, ideas for furnishing and decor, wishing to improve their building (or other) skills, or who just wishes to keep abreast of the latest building / home trends in Second Life. Throughout the Expo there will be a range of events and activities, including entertainment and dancing, classes, gachas, talks and discussions, an art show (with pieces by Your’s Truly – all proceed from their sale to RFL of SL), a market, an auction, and more. This year’s hunt allows participants to explore the Expo regions and visit the twenty Awareness kiosks where they can learn about the different types of cancer. There are also hand prints and ribbons to collect, which denote which kiosks you’ve visited and decorate the tree on the Hunt HUD (available for L$250 from hunt vendors). In addition, the Awareness kiosks may award participants an additional random prize. When you’ve visited all twenty of the Awareness kiosks, hunt participants will receive an Meeroo avatar. Twelve homes have been set-up on Home Expo 6, in six different styles by six different builders. The twelve entrants in the competition will be given an allowance of 500 prims (/Land Impact) with which to decorate their home and its garden. Each contestant can decorate in any style they wish that suits their house, but they must include at least three items purchased from RFL vendors at the Home and Garden Expo. All houses must be decorated by Saturday, May 26th, 2018. Thereafter, from Sunday, May 27th through Friday, June 1st, 2018 visitors to the Expo will be able to vote on which house and garden they like best. The breakdown of prizes has yet to be announced, but the overall prize pot, at the time of writing this article, stood at L$35,000. Visit the competition page to enter – and remember, applications must be made by the end of Monday, May 21st, 2018. Every day of the Expo at 16:00 SLT, lanterns will be released from the Expo Reflection Centre, in honour of all those afflicted by cancer. The reflection area is also the place where you can light a luminaria lantern in memory of a loved one or in support of one fighting cancer now. With so much to see, it is likely that more than one visit might be required to see all of the designs and gardens – and with the number of exhibitors, pointing to specific creators is a little unfair. I therefore suggest that should you go, start your visit at the central Expo Center region – and then work your way around the regions using that as your anchor point. The Home and Garden Expo raises money for Relay For Life of Second Life (RFL of SL). Relay For Life is the American Cancer Society’s signature fund-raising event, and RFL of SL is one of its virtual counterparts. You can find more information about RFL of SL at the official website. Expo exhibitors are required to have two 100% donation items at the Expo. These items must be new and exclusive to the Expo for the duration of the event. 100% of registration fees, sponsorship fees and donation items are paid to Relay For Life of Second Life. 50% of the proceeds from the gachas will be paid to RFL and 100% of the L$10 hunt items.